Add a local user account or a user account from Active Directory, described later in this article. You can also add users by importing an Active Directory group. See Create Groups via Active Directory. Import Users via a CSV file that you create using the CSV Import File Guidelines. By default site administrators can add and remove users on a site. On the site’s Settings page, server administrators can revoke that capability, so that only server administrators can manage the site’s users. A site administrator can edit an existing local user account only if the administrator has access to all of the sites the user is a member of. For example, if User1 is a member of sites A and B, an administrator of only site B cannot edit User1’s full name or reset the password. Sign in to Tableau Server as an administrator, and if applicable select the site. At the top, select Users. On the Users page, click Add Users, and then click New User. Enter a user name. 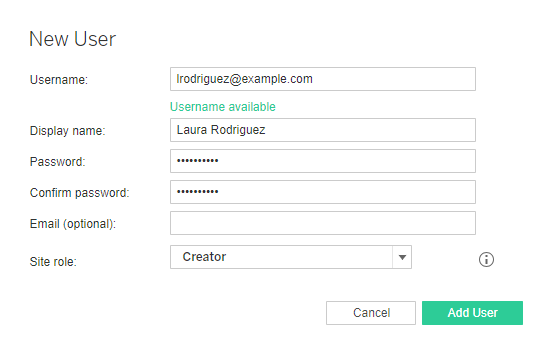 With	local authentication, using an email address for the user name is the best way to avoid user name collisions (for example, lrodriguez@example.com instead of lrodriguez). Display Name—Type a display name for the user (e.g., Laura Rodriguez). For site role definitions, see Set Users’ Site Roles. Before adding users to a site, be sure to review User Management in Active Directory Deployments to understand how multiple domains, domain naming, NetBIOS, and Active Directory user name format influence Tableau user management. In a site, click Users, and then click Add Users, and then click Active Directory User. Enter one or more user names (separated by semicolons). If you are adding a user that is from the same Active Directory domain that the server is running on, you can type the AD user name without the domain. The server’s domain will be assumed. Note:Do not enter the user’s full name in this field; it can cause errors during the importing process. 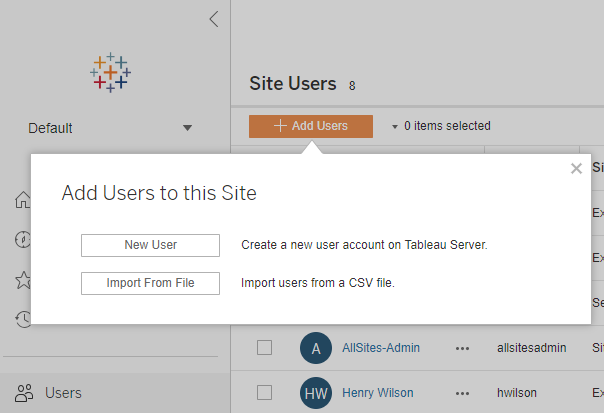 Sign in to Tableau Server as an administrator, select the site, and open the Users page. Select the check boxes next to the users’ names, and on the Actions menu, select Remove. If a user is a member only of the current site, and they do not own any content, the user is removed from the server. If a user you remove from the current site is a member of other sites on the server, their status remains unchanged on those sites. You can also Add Users to Tableau Server, without site affiliation. Upgrading Tableau Server to version 2018.1 or later from a pre-2018.1 version, without activating user-based licenses, affects users who were assigned the Viewer site role in the pre-2018.1 server version. To learn more, see the section “User-based licenses” in the Licensing Overview and see Set Users’ Site Roles.